The hype around the highly anticipated Bill Goldberg WWE return continues. While nothing continues to be announced publicly, reports continue to indicate that a WrestleMania rematch between Goldberg vs. Brock Lesnar is a done deal. Most presumed that the announcement would come on Wednesday when Bill Goldberg appeared on ESPN Sportscenter. Goldberg appeared on ESPN to promote the upcoming WWE 2K17 videogame. Instead, Goldberg told Coach that he needed time to get ready and gave no indication that a match with Lesnar is imminent. Dave Meltzer reported in the latest Wrestling Observer Newsletter that the match is a done deal and is booked for Survivor Series in November. The timing may seem odd as most presumed the match would go down at WrestleMania. 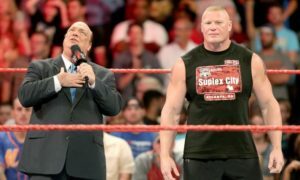 Meltzer reports that the WWE has plans locked in for Lesnar (which look like Shane McMahon) and the match is simply a one-off to promote the game. It would seem odd that Goldberg wouldn’t give any indication that a match was booked, especially since it is less than two months away. My gut is that Goldberg said those things on ESPN to throw off the rumors, which are red hot this week. While that’s cute, it really doesn’t make sense to me from a business standpoint. Unless they have a big angle planned to kick off the promotion on an upcoming RAW. Goldberg is 49 years old and hasn’t wrestled a match since 2004. Coming back for a match against Lesnar after such a long layoff is no easy task. The last time they wrestled was back at WrestleMania 20 and the match remains one of the low points in Mania history. With age and a layoff I can’t imagine the match being much better.